I am Sudha’s baby boy and this is my story. I have been in the hospital since September last year, and every day is a struggle for me. 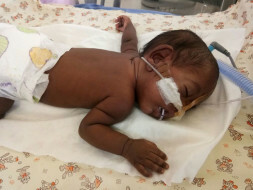 I was born at only 27 weeks; I guess I just couldn’t wait to meet my mom and dad but I haven’t had my happy moment with them yet. I haven’t even started breathing on my own. I weighed only 770 gms at first, but now I weigh 3.5 kg. Strong baby, you would say, but you know how I was able to fight this much? It was only because my parents did not give up on me. I had severe respiratory problems and growth retardation, and there was a point where it was doubtful whether I would survive. But my mother did not give up hope. Despite not having any money, she and my father made sure I got the treatment I deserved till now. Right from battling high blood pressure to undergoing an emergency c-section to have me, my mother has gone through a lot. Before being pregnant with me, she also quit her job – she was working in a small office. All she wants in her life right now is to take me home and see me grow up. The doctors say that my health is improving, but that I need more time in the NICU to get past the serious stage. I want to be with her. I want her to carry me and make me feel safe. Right now, she can’t even hold me as I am in the ventilator, fighting for my life. I have a dozen tubes covering my face. I know I am too little to wish for anything, but I want to be able to take a breath of fresh air. I also want to feel the warmth of my mother when I drink milk. But now, I am drinking milk through tubes that are too big for my tiny face. I know my parents have suffered so much to see me live, so I want to be able to take care of them when I grow up. But will I grow up? Will I survive another day in the NICU? I need to stay in the NICU for a few more days until my health stabilizes and my lungs develop completely. But my father cannot afford the expenses. He used to make only Rs 11,000 a month as a cook, but had to quit that because my grandfather fell ill too. My parents are distraught. They want me to live, but they are helpless. Will you give me a chance to grow up in this world? The specifics of this campaign have been verified with the concerned hospital. For more details, please contact the campaign organizer or the hospital. Unfortunately, with inexplicable grief, we're having to inform you that the baby passed away. He developed chronic lung disease and sepsis. 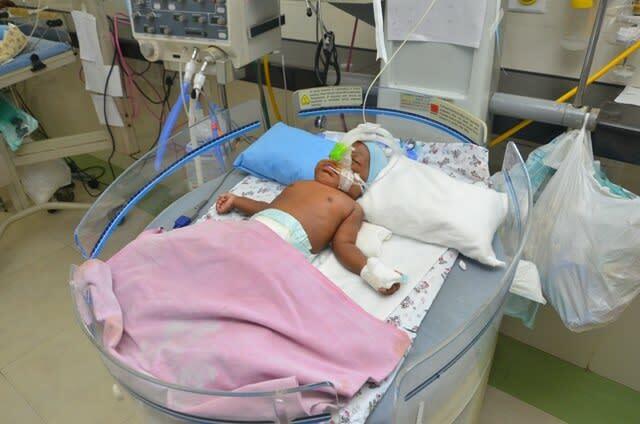 He also had a bout of severe infection which further worsened the baby's health. 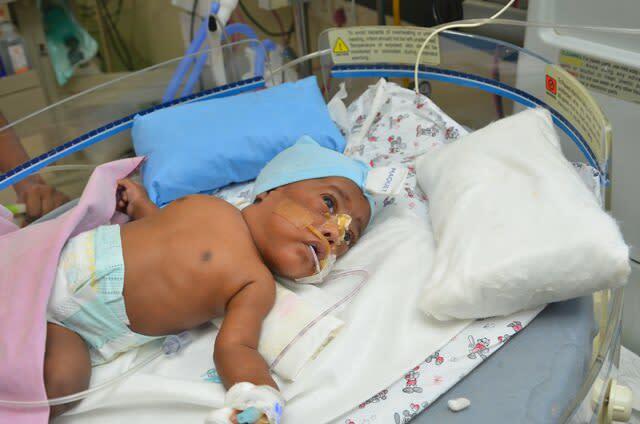 Only because of you, could we provide him the best of medical care possible. Thank you everyone. We shall forever be indebted to you. 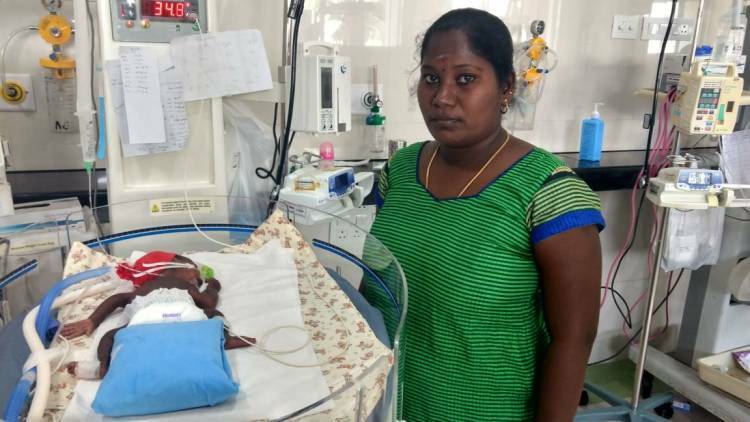 Thank you for the love and support you have shown towards Sudha's baby so far. He underwent the treatment and was recovering successfully but will require an extended stay in the hospital until his health stabilizes completely and his lungs develop. 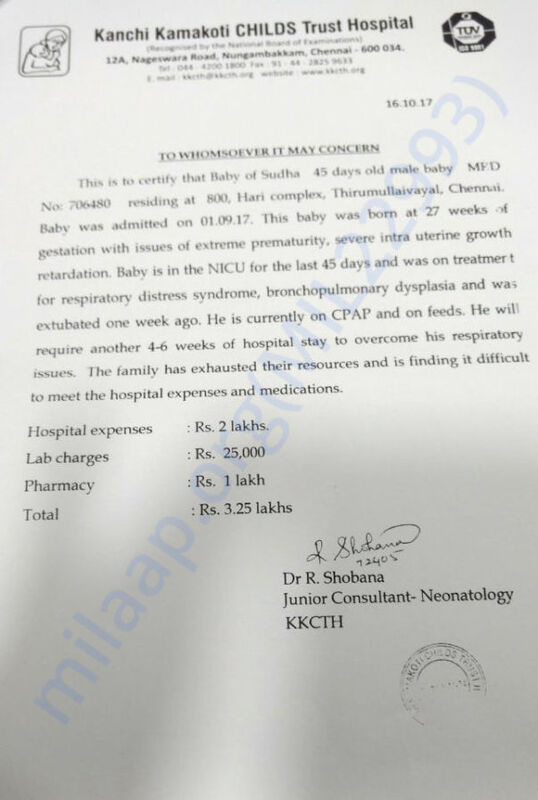 He currently weighs at 3.5 kilograms and would be in the hospital for another few days hence we are increasing the target amount. 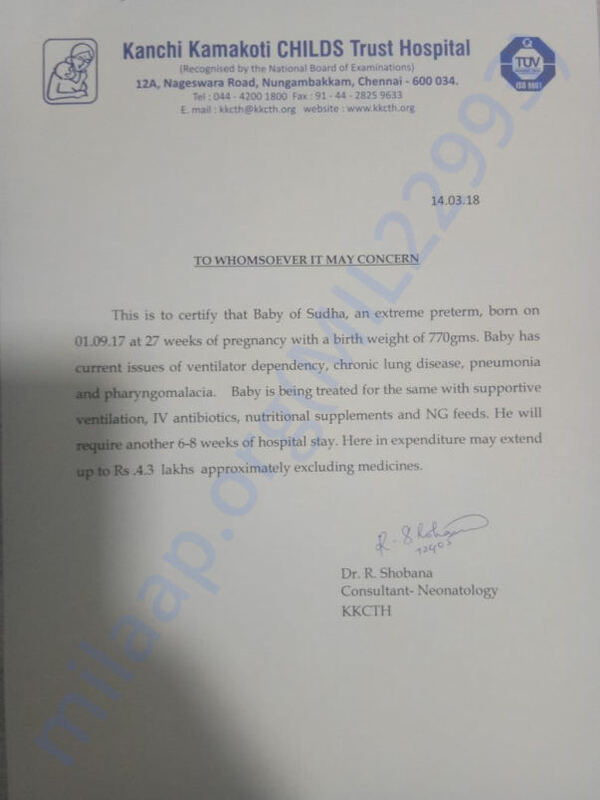 Please find the doctors letter attached in the update below. Thank you all once again for all the support. Do share this campaign further to help us in raising funds towards her treatment. Please pray for his health and speedy recovery. Will keep you posted. 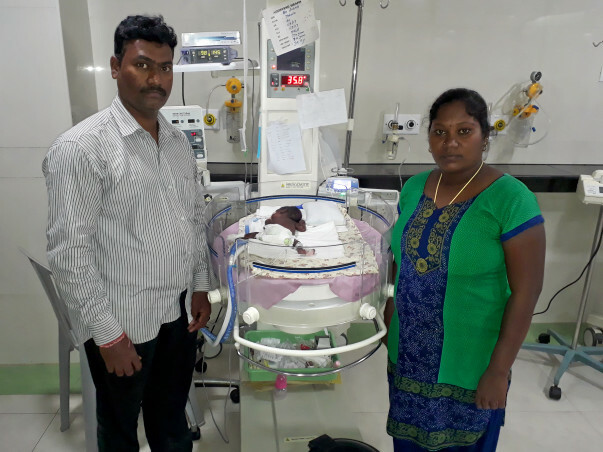 Thank you for the wonderful support that you have shown towards Sudha's baby. He is doing better now compared to earlier. 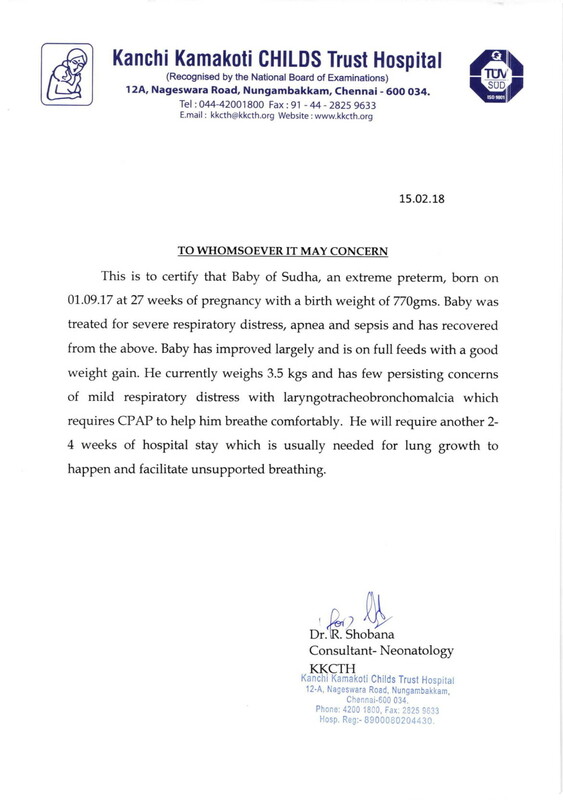 He weighed 770 grams when he was born and now weighs 3.2 kilograms and would require approximately 4-6 weeks of hospital stay until his lung is able to support him. He is on ventilator and antibiotics support. He has recovered very well and is on low oxygen support. Thank you all once again for all the wonderful love and support. Rise up and Shine, little boy!